There’s nothing worse than being caught off guard. You feel pressured and clueless on how to react appropriately. This is why employees are prohibited to quit without notice as their absence can greatly affect business operations. 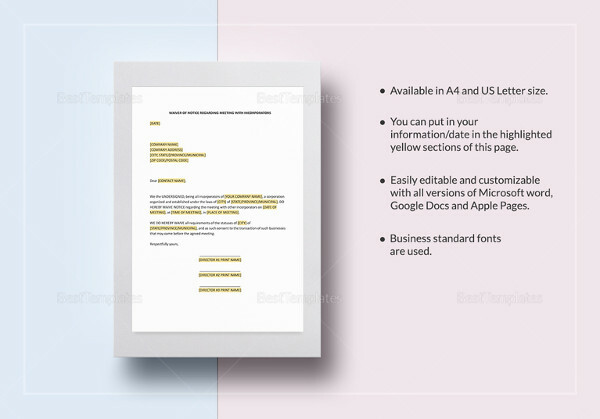 They are typically asked to submit a two week notice to give the company enough time to adjust to the changes. The same goes for business meetings. A business meeting doesn’t just happen out of the blue. Participants are informed beforehand of the basic details of the meeting as well as its agenda template. 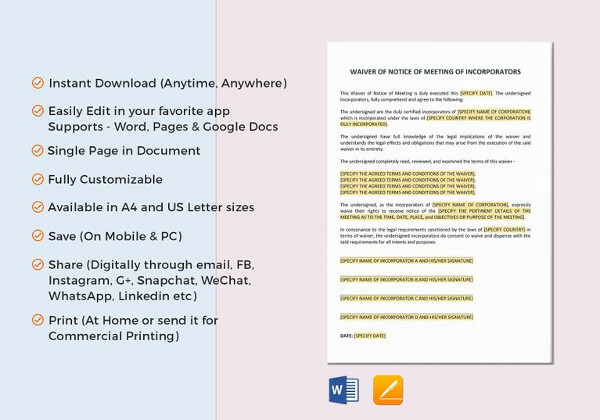 This can be done through a notice of meeting. 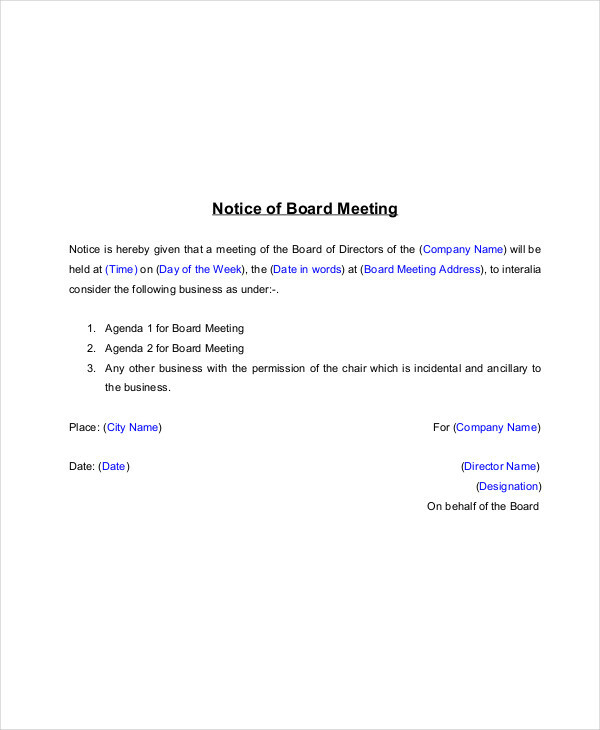 What Is a Meeting Notice? 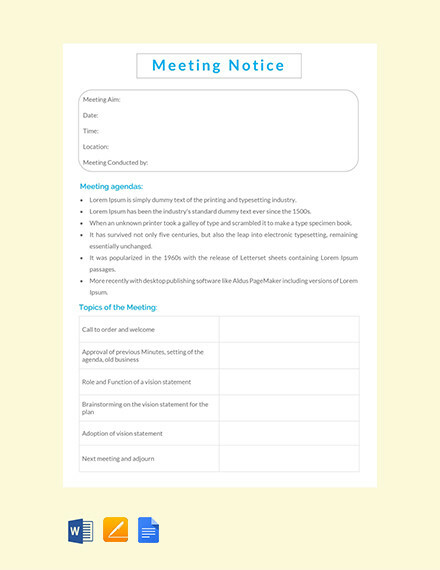 A notice of meeting is an invitation used to inform attendees of a corporate meeting that shall take place at a give time and place. Similar to a business meeting agenda, topics and discussions to be covered are clearly stated. Attendees are also informed of any potential changes in the meeting. 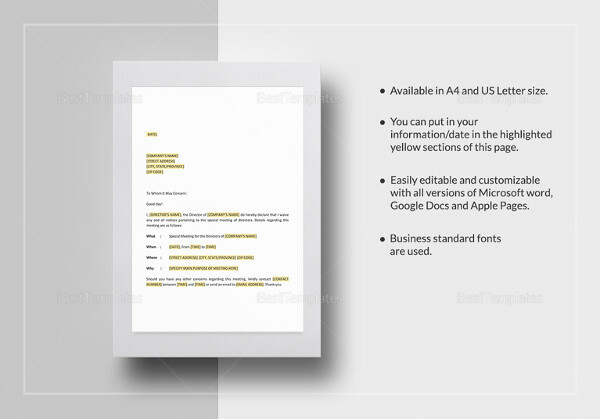 It can take form through a notice letter, a memo, or an email invitation. 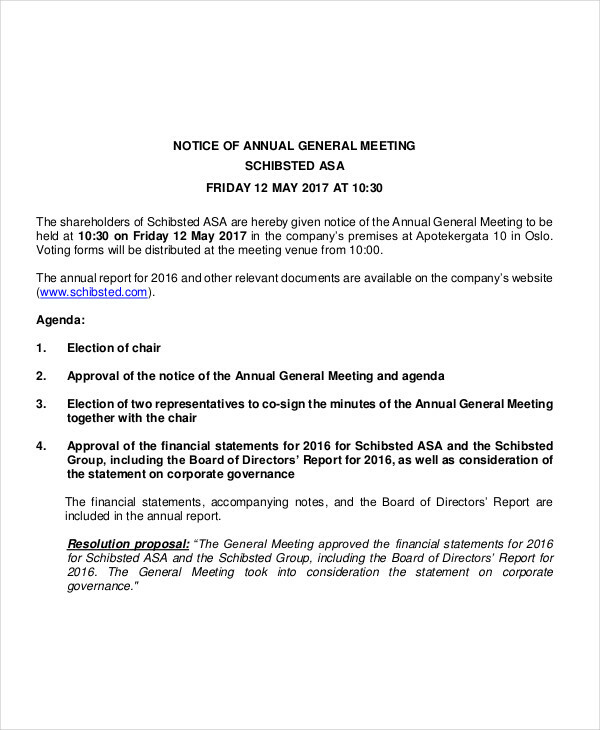 Why Do We Need a Notice of Meeting? For starters, meetings are conducted so that significant members of an organization may play a part in the decision-making process. 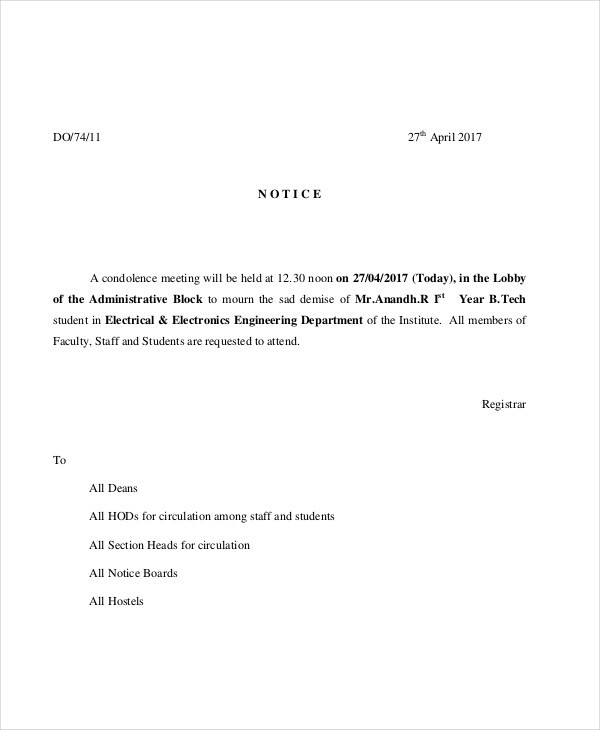 A notice of meeting will ensure that all participants are well aware beforehand. Otherwise, conflicts may arise due to unfavorable decisions made by only those who were present. 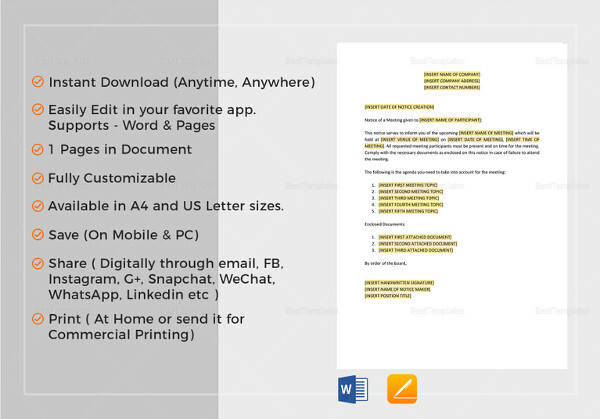 Write a Two Weeks Notice, should always be sent ahead of time. 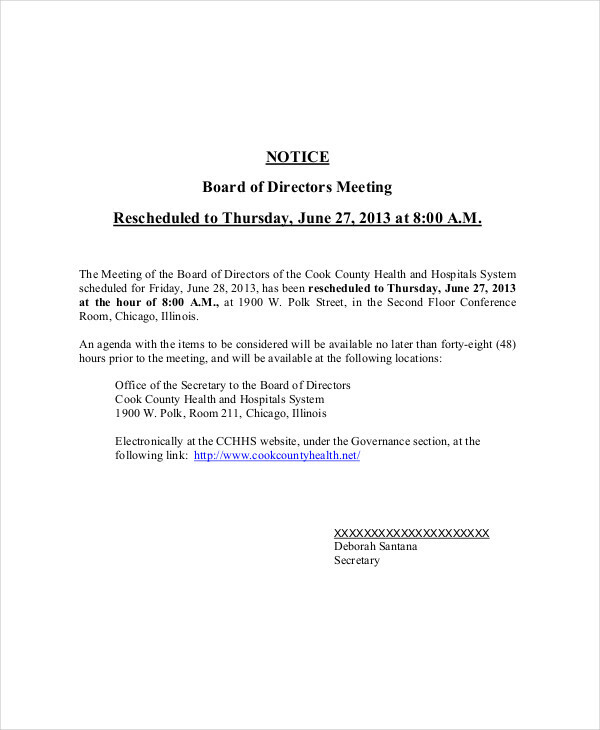 This is so participants may make changes to their personal schedules to make time for the corporate meeting. 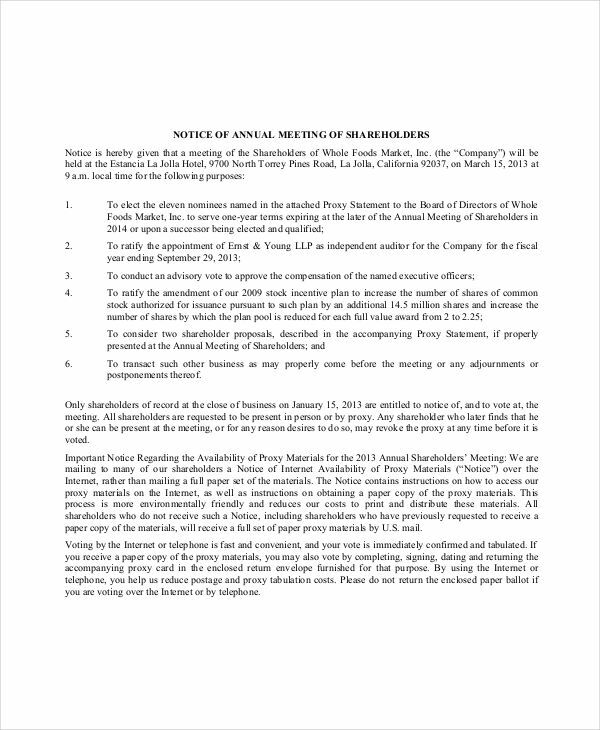 Corporations are responsible for conducting annual meetings. 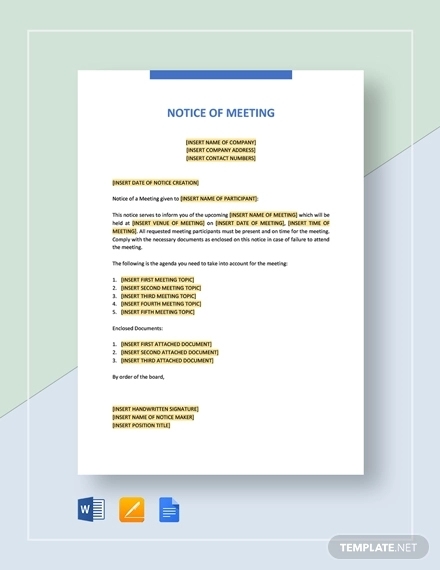 In accordance to company rules, they are required to disseminate the details of a meeting through simple notices. 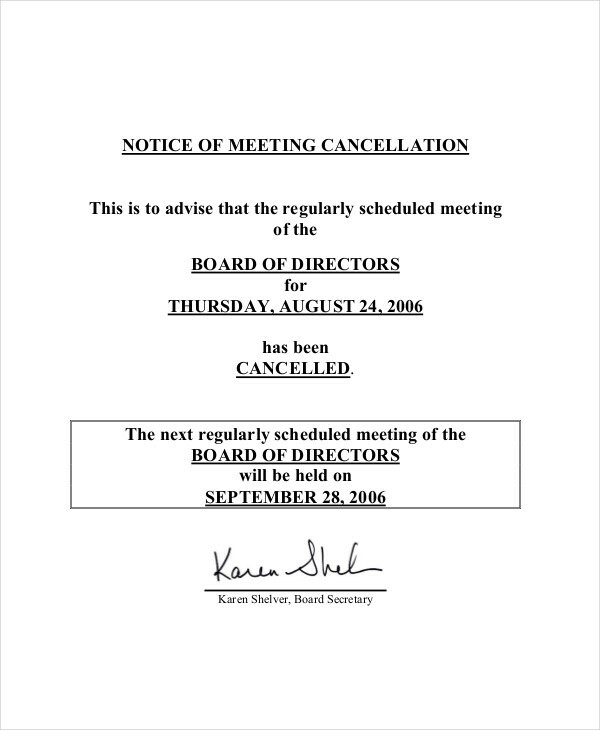 It is considered to be a legal obligation for a company to present notice of meetings. This is typically published at a considerable number of days to give participants the chance to prepare. 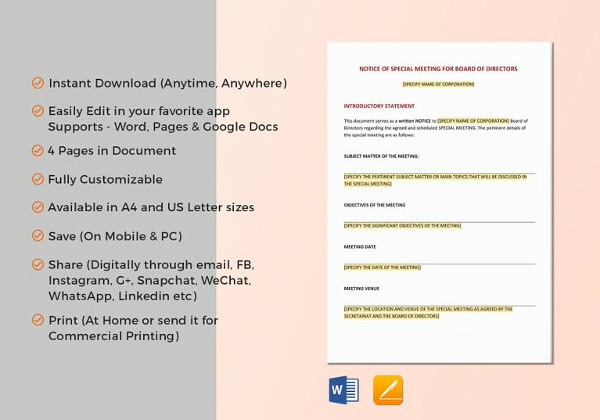 Meeting notices are beneficial in such a way that it can properly gather participants. This is so the majority, if not all, of the participants may actively take part. 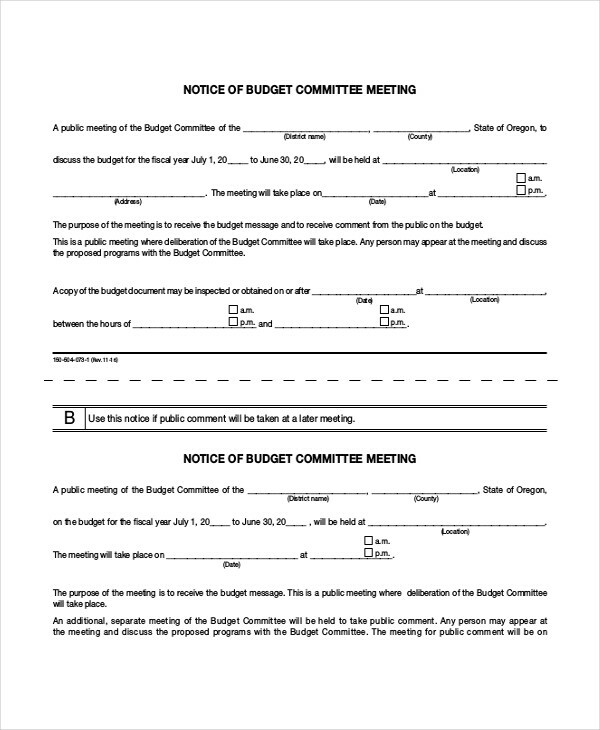 It will also allow participants to prepare ideas and resources for the meeting’s agenda. After all, participants have the right to be informed of important business plans and operations. 1. It should be delivered to the right participants. Only individuals whose presence is required should be informed of the meeting. 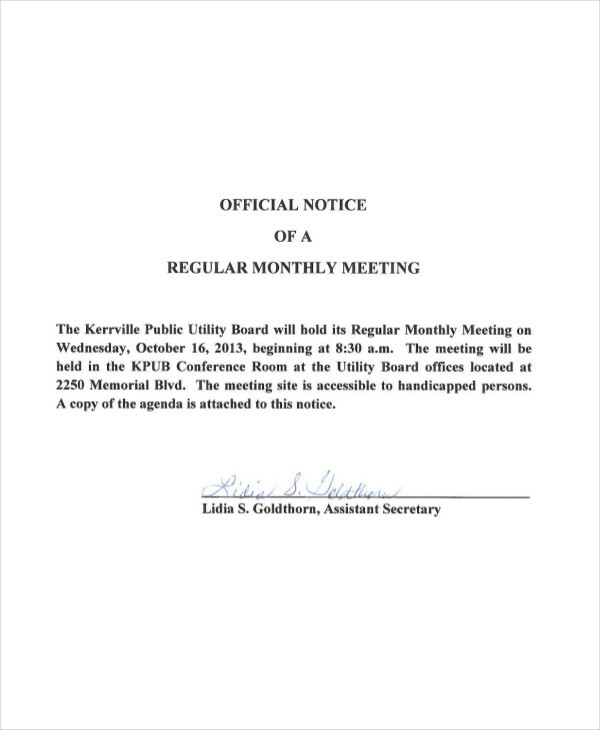 The date, time, and venue of the meeting should be clearly stated. 3. 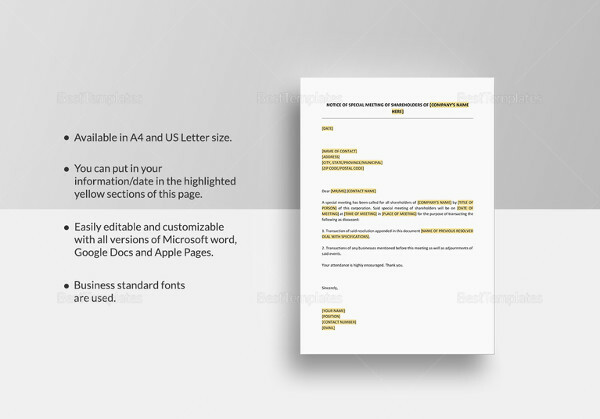 Include items of business. 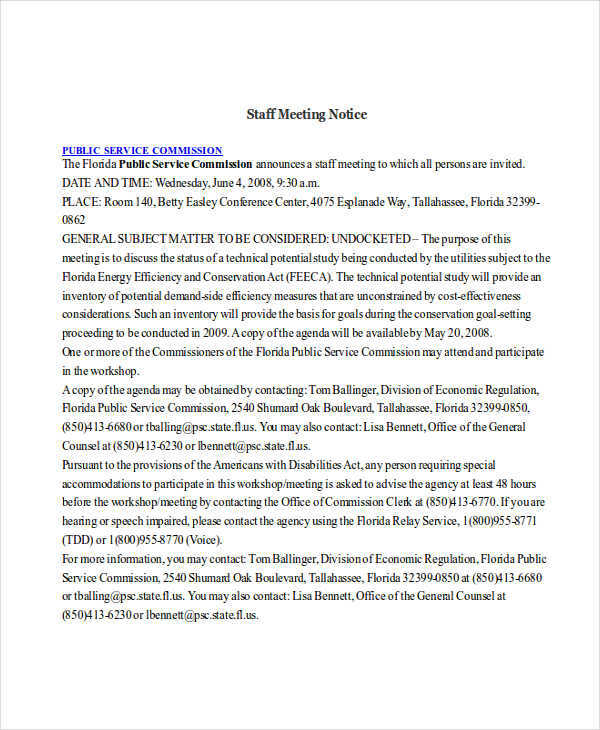 This could be the business agenda, proposals, and other business matters that are essential to the meeting. 4. Give an advance notice to participants. Even when giving a short notice, a considerable amount of time should be given for participants to adjust and prepare.